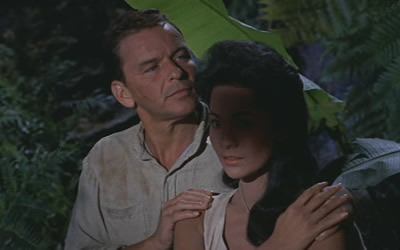 THE DEVIL AT 4 O’CLOCK starts with a young priest (Kerwin Matthews) landing on a French Polynesian isle to replace old ‘Father Doonan’, caked with vehement crust by Spencer Tracy. Three cons arrive with him—wiseguy Jersey punk Frank Sinatra, muscles-with-dignity Bernie Hamilton and derriere devotee Gregoire Aslan. Before we went to prison we hoped we’d at least get to rescue some lepers. 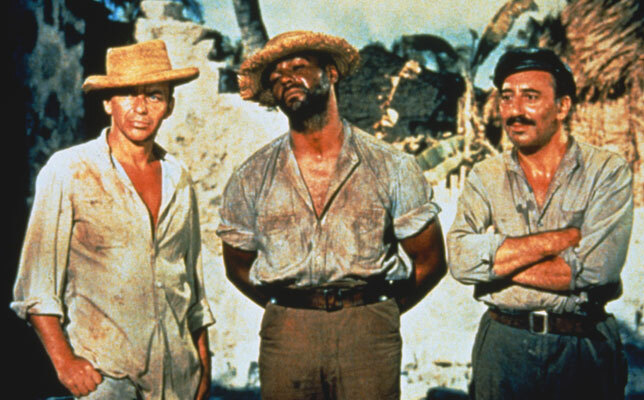 Add a leper colony, a blind beauty (Barbara Luna), a sagacious doctor and an aging ex-tart and you have enough incipient simmering melodrama to make the reef smoke. And that’s what it does: as all these folks meet, mingle, match wits, make out and mildew (there’s six million 1961 bucks of sweating involved) the island’s trusty volcano is getting ready to barf. Frank actually putting the moves on a blind girl. Despite the predictability and the cliches, it’s fun and pulpishly compelling. Hearts-of-gold are beating in the three convicts—where would helpless innocents be without decent criminals? Hoods opting for virtue has always been one of Hollywood’s most dependable untruths. The supporting players are all good, location shots in Hawaii and of the studio jungle are attractive, Mervyn LeRoy’s direction keeps it smoothly moving along its 126 minutes, and there’s a nice assist from George Duning’s properly portentous score. 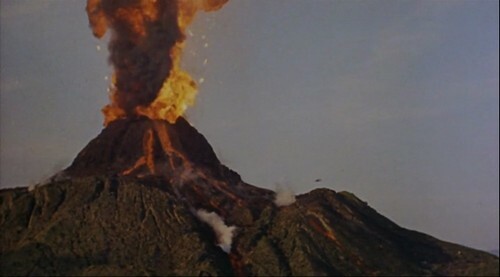 The final eruption is one of those ear-splitting, eye-filling fakes that joyously deceived audiences of the day—it still looks cool. They did a huge mock-up on the back lot: darn thing was 45 feet high, 200 feet long and 50 feet wide and was packed with a ton of explosives. When it blew it almost killed the helicopter crew filming it. Reviews were okay, and at 35th place it made money, $6,700,000, but not enough to cover its costs. I have a soft spot for this old chestnut, with a memory of being excited by seeing the Coming Attractions poster at our local theater (the great John Danz) in Bellevue when I was six or seven. With Jean-Pierre Aumont, Cathy Lewis, Alexander Scourby, Martin Brandt, Marcel Dalio. Old-fashioned fun.